TODAY we shall focus primarily on the U.S. Patent and Trademark Office (USPTO), but first we shall give a little update from Europe. “…it’s pretty incredible that even amid the resignation of Gyimah these people pretend that the sole question is, “can Britain participate?” (in something that doesn’t even exist! )”CIPA’s chief inside IP Kat was, in our humble assessment, one of several factors that ended coverage of EPO scandals. It just didn’t suit the authors’ interests; they’re leading proponents of the UPC, which is impeded by corruption at the EPO, not to mention an attack on judges’ independence. 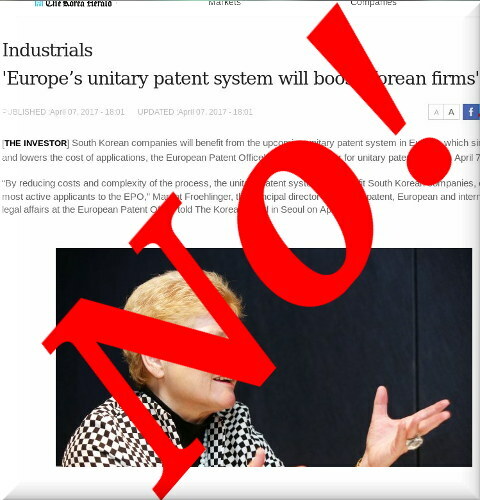 The Unified Patent Court (UPC) is not yet established and is dependent on ratification of the Unified Patent Court Agreement by Germany (which itself is dependent on the outcome of an ongoing constitutional challenge). It is currently unknown whether the UPC will be operational before Brexit day, i.e. 29 March 2019. Even in a ‘no deal’ situation, the UK is committed to exploring whether it will be possible to participate in the UPC and unitary patent system. It is worth noting that the UK ratified the Unified Patent Court Agreement in April of this year, i.e. after having started with EU withdrawal process, which indicates that continued participation in the UPC is considered by the UK government to be politically acceptable, notwithstanding the fact that the UPC is required to apply relevant EU law in its decisions. If the UK is prevented from being involved with the UPC and unitary patent then patent protection and enforcement in the UK will continue just as it does now.